Crafted of cast stone for a rich texture and year round durability. They are made to be weatherproof & guaranteed to last a lifetime. 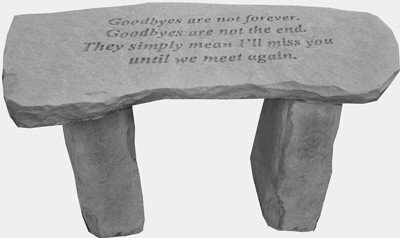 This small memorial bench will provide a tranquil resting spot in your garden. Dimensions: 12" x 29" x 14.5"
If you have any questions about this product by Kay Berry Inc, contact us by completing and submitting the form below. If you are looking for a specif part number, please include it with your message.